There is no pure osm2po-Demo, yet. However, you can see osm2po in action by following this link to a very hot project I'm currently working on. The Demo is free but limited with regards to the requests you may send within a given time. osm2po is both, a converter and a routing engine. osm2po's converter parses OpenStreetMap's XML-Data and makes it routable. osm2po is able to convert large sets like europe.osm. osm2po generates sql files for PostGIS, compatible with pgRouting and Quantum GIS. osm2po creates compact topology/graph files for the integrated routing engine. 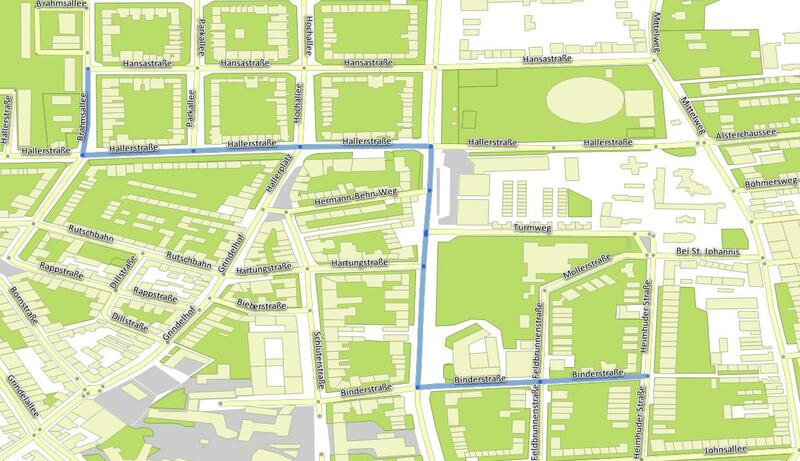 osm2po contains a simple HTTP routing server which returns CSV, GeoJson, SOAP or starts the WebTestUI. osm2po runs under Windows, Unix and Mac. Just make sure you have Java 6+ installed. osm2po does not depend on foreign Java libraries. osm2po's core is just one file. No installation is needed. packaged as one jar without any dependencies. return just-in-time commands like In 500 meters turn left e.g. The current version supports English and German. But it's also possible to mix in recorded voice tracks or other languages. You are free to make copies, give exact copies of the original to anyone, distribute it in its unmodified form via electronic means. You may not reverse engineer, de-compile or disassemble it, rent, lease, lend or sell it. This software is provided 'AS IS', without warranty of any kind, so use it at your own risk. Creates a PostGIS-Table of simple Areas, Buildings, etc.